Drs. R.C. Sproul, John Gerstner, and Arthur Lindsley provide a rational defense of Christianity and a friendly refutation of Cornelius Van Til’s presuppositional apologetics. They assert that Christianity is eminently reasonable and provide tools for sharing the faith. This book is divided into three parts. Section I is a prolegomenon dealing with the problems and methods of apologetics. Section II develops the theistic proofs and authority of Scripture. 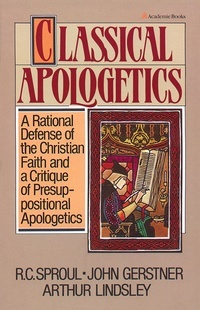 Section III is given over to a critique of presuppositionalism in apologetics. Classical Apologetics will help the thoughtful Christian understand his or her faith better, and it will provide more solid grounds for sharing this faith with others.